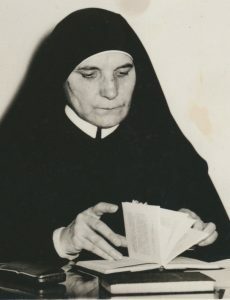 She did not always find fidelity to the Founder and dedication to the Congregation with its many worries and fatiguing responsibilities simple and compatible in day-to-day practice. Her responsibilities energized her but she also felt the exhaustion of self-immolation. Religious life was a crucifixion. “The vows,” she said, “are the three nails that bind a soul to the service of God.” And she threw herself into this service without hesitation, accepting in advance all the consequences of her decision. This is the sublime mysticism of Christ. Annihilation in him yields abundant fruit, and that fruit is apostolic work. Immolating oneself on this earth enables a person to rediscover life; it makes a person a bearer of life. But it is a work of grace. Sr. Thecla opened her entire being to the grace of God. She died to self so that Christ might live. And the grace she received in return gave her life such depth and power that it seems like she is still alive today. Aware of the grandeur of the [Pauline] vocation, she lived it by dying to self and living in Christ. She wanted her daughters to do this too so as to be worthy of such a lofty gift of God. Therefore she felt there should not be any ambiguity about the meaning of the [Pauline] vocation. Every thought that could soil its beauty–that is, assimilation in Christ–was to be banished. […] A woman of faith, her apostolic activity was extraordinary. Because her gaze was fixed on Christ, she saw in him the needs of people. But she was also a woman of marvelous and sublime hope. 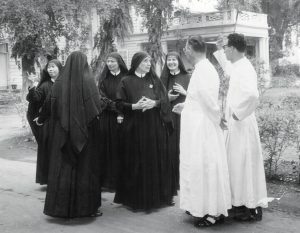 The last time I saw and spoke with Sister Thecla was during her final visit to the Far East. I remember that evening clearly: night had already fallen when I met her in Rizal Memorial Park in Manila. The park was crowded with people waiting for the Corpus Christi procession to arrive from the Cathedral. Sr. Thecla was standing on the sidewalk, the beads of her rosary slipping through her fingers in ceaseless prayer. She smiled when she saw me and we greeted each other. As we talked, what struck me was that the things she spoke about all had to do with spiritual matters, which she discussed without any airs or spiritualistic affectation. She continually referred to God, very simply and I would almost say ingenuously. She was like a little child, in the biblical sense of the word. I also remember an occasion on which, many years prior to this, I stopped by the FSP residence in Rome and found Sr. Thecla in the courtyard with some other sisters. They were all sewing and embroidering. I paused to exchange a few words with them and one of the group asked me why I did not talk about heaven in my classes (I was teaching a course on St. Paul at the time). 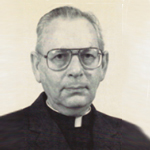 Heaven was Sr. Thecla’s goal. She kept her thoughts fixed on it and this gave her the energy she needed on her hard journey through life. This text is taken from the testimony of Silvano Gratilli, ssp, delivered at the Congress: “I Carry You in My Heart”: Twenty-Five Years after the Death of the Servant of God Maestra Thecla Merlo, Rocca di Papa (Rome), 2-5 February 1989.